After acquiring my first half wave end fed by PA3EKE (HyEndFed) I was curious how it would perform compared to my Ventenna dipole. The Ventenna is a portable dipole - developed in and sold from the US - that consists of various elements that you can screw together to make a resonant dipole for different bands. When I started on HF in 2010 I used this antenna in the attic to make my first contacts. The HyEndFed is an end fed wire antenna. 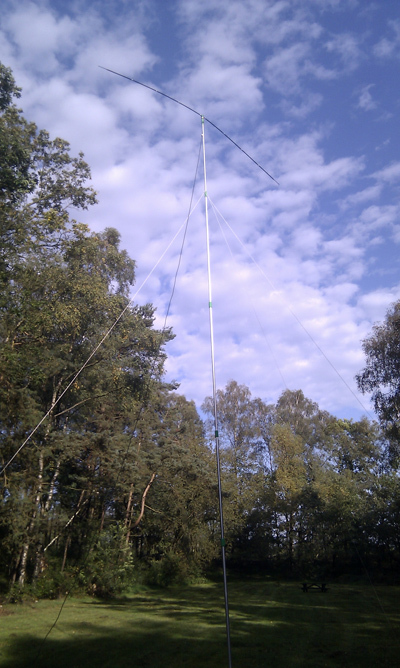 PA3EKE sells it in single and multiband configuration. The first one I bought was the 20m 300w PEP version. For the test I set up the Ventenna portable dipole on a aluminum push up mast @ 9m and the HyEndFed end fed half wave wire vertically on a Spieth “fishing rod” at 12m (feeding point at 2m). The dipole was turned into the direction of the station being worked. After this test I concluded that there was no real benefit in bringing the Ventenna and the bulky mast with me when operating portable. The wire performs at least as well, is set up in no time and is omnidirectional.